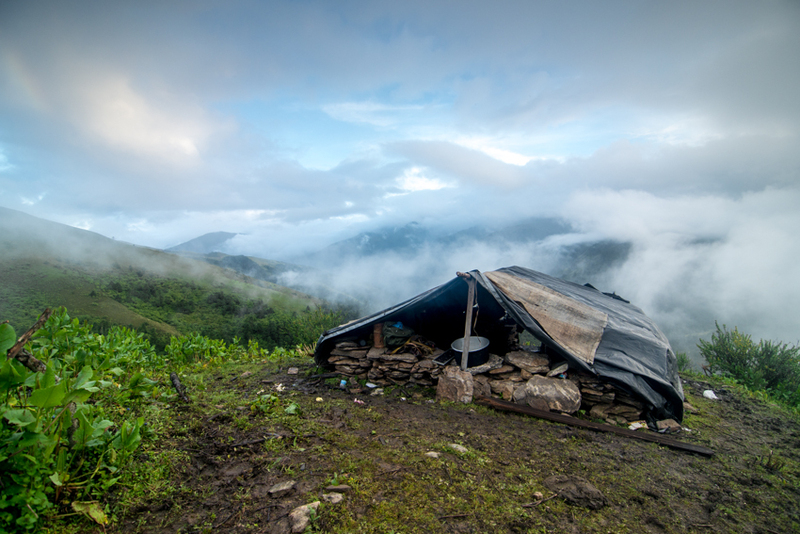 In the peak of the monsoon season I planned a 4-day trek into the highlands of Haa, a western Dzongkhag of Bhutan. 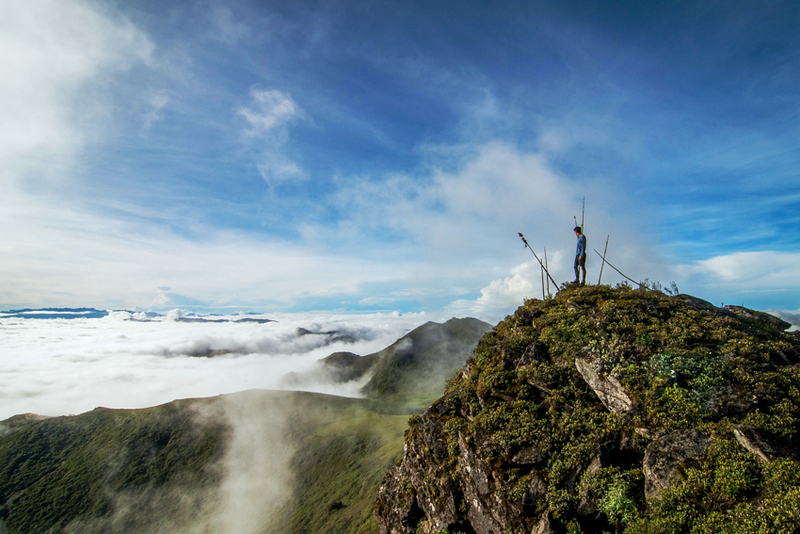 Many epic stories are told of this area, which boasts high altitude grasslands, alpine lakes, herdsmen and their yak, unique flora/fauna, and a remoteness that seems far even to the local Bhutanese. The end destination was Nub Tsho Na Pata, literally translated as ‘the great lake to the west’. The 4-day trek started off with a breezy 12-hour hike to an abandoned herders shelter, which my companions (an uncle and nephew duo from Haa) swiftly converted into our home for the evening. After 12 hours of hiking I surprisingly felt strong and full of energy, but as I realized the next day, the altitude being above 4000 meters, soon had an effect on me. The next day’s trek consisted of a mere 4 hours, but taxed my body heavily and I felt as if I had completed something superhuman. TEK (Traditional Ecological Knowledge), as defined in my previous post, is something that develops over many generations. And this knowledge is transferred verbally and experientially. Meaning that the new knowledge holders need to be in the field learning from previous knowledge holders. 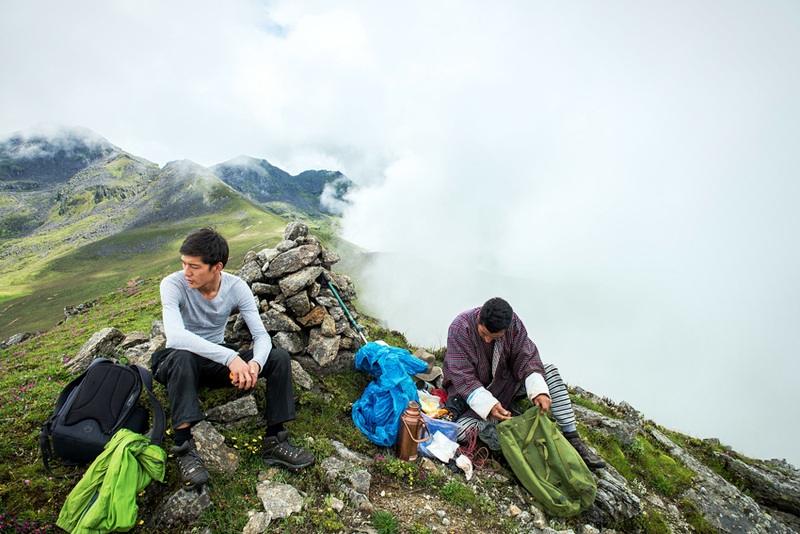 Such opportunities are few these days as Bhutanese youth are exposed to higher education that was not available in previous generations, and they spend more time in the classroom, and less time in the forests/highlands/fields. While the benefits of education are of course encouraged and eagerly accepted, it has also come at a cost of losing a distinct form of knowledge and an intimate connection to the land. The Chukha Metho was yet another plant I experienced for the first time on this journey. 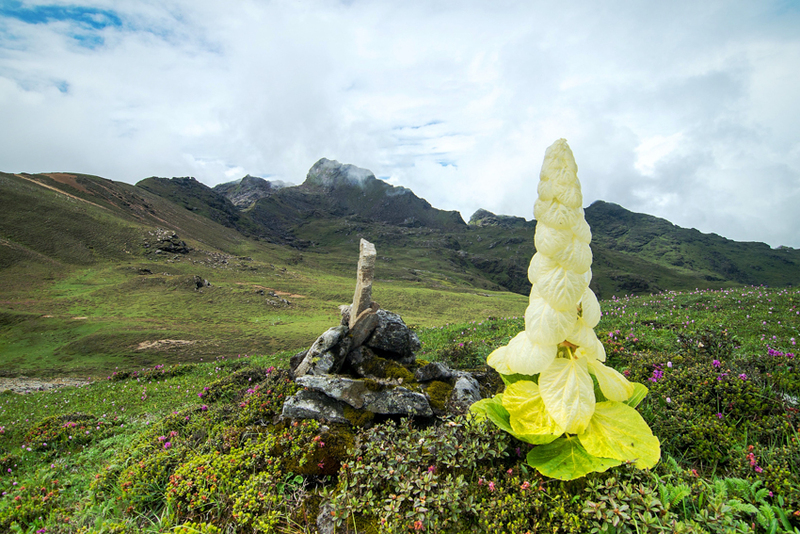 This high altitude flowering plant is a unique site with its yellow umbrella flowers that shade its core stem that is sought by highlanders. Rather than a bitterness to cure my cold, I was delighted by a fresh tartness that left me wanting more. 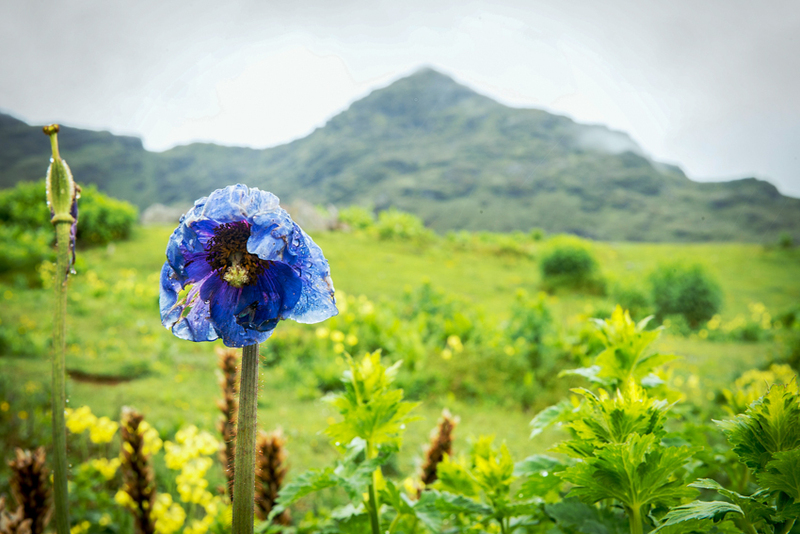 Another rare siting was that of the Himalayan Blue Poppy, the national flower of Bhutan. This flower, while lacking medicinal properties, blessed us with a display of beauty that we left for future onlookers. After 16 hours of hiking we made it to the famed Nub Tsho Na Pata. 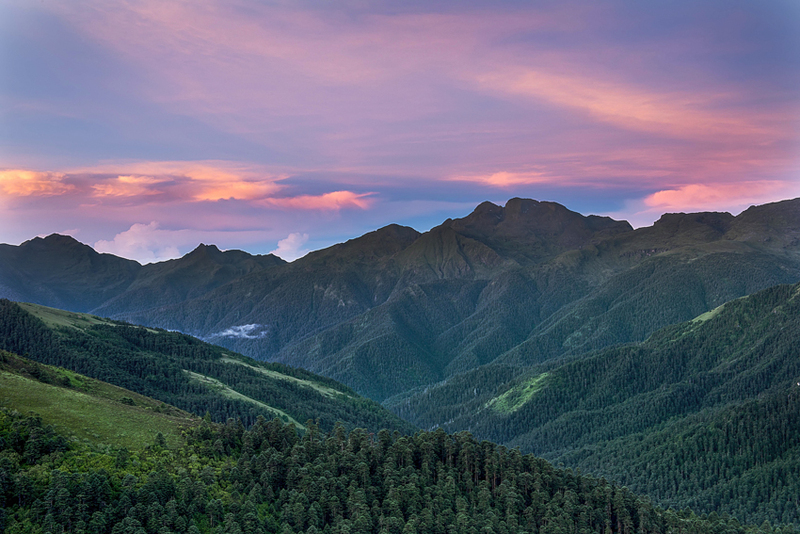 The great lake was adorned with two waterfalls on the south end and opened to views of Tibet in the north. We were greeted with monsoon rains for most of our visit as well as a number of brown trout that I can now confirm exist. The return trip continued with the same theme, full of stories and lessons from the land. On the last day I interviewed the uncle who had served as our guide and teacher and asked him about the difficulties and joys he has experienced herding this region. More on this interview will come, but I was impressed by the pride he had in the area and the way of life. While it is not something he would necessarily wish upon his nephew or his own children, this semi-nomadic livelihood was something that he identified with and recognized was fading away. 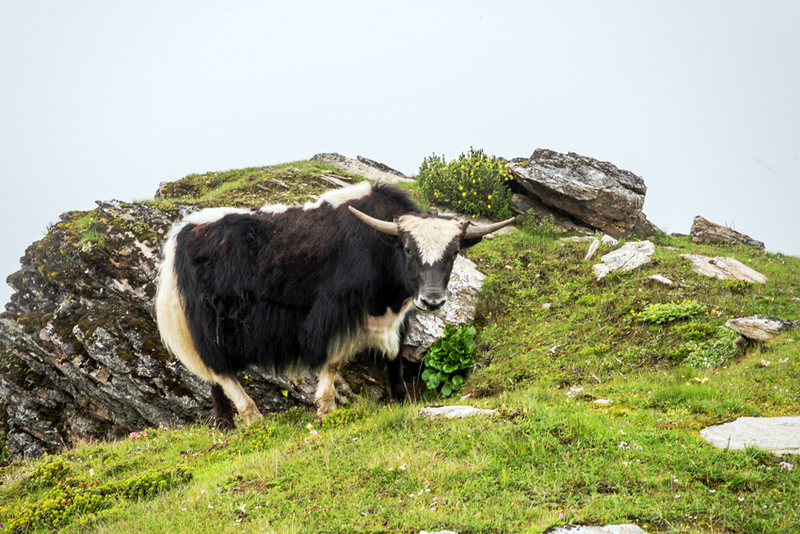 While vastly different than the Tibetan context, in which herders are encouraged to abandon such a lifestyle, the Bhutanese are freely leaving it due to other socio-economic changes. What’s to be done? Well, not a lot. Change is a natural part of society, and with it will come both benefits and drawbacks. 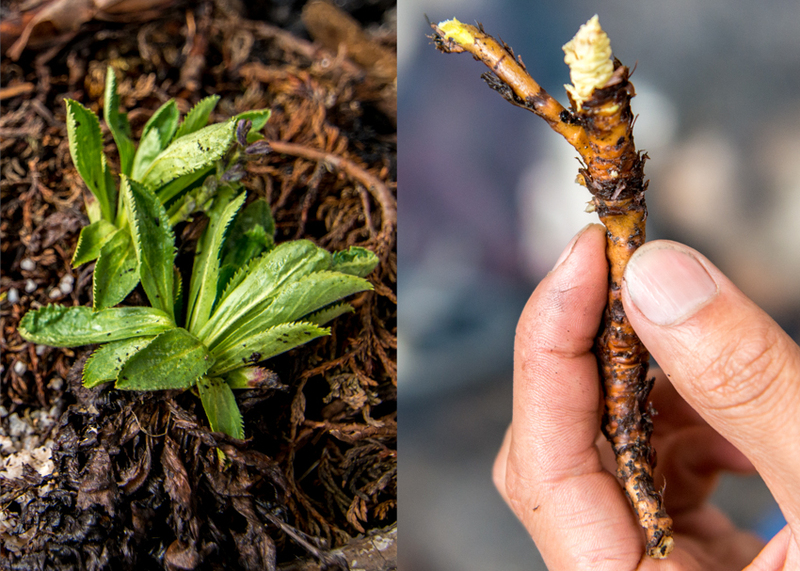 However, with the current generation of Bhutanese benefiting from better education and avoiding the harsh nomadic lifestyle, the society as a whole will need to find ways to preserve the TEK that exists.